A trip to the North Georgia mountains means many things. People travel to these gorgeous mountains for the scenery, but they also want to experience all the exciting activities the mountains have to offer While you're planning your next trip to our neck of the woods the first thing you'll need to do is book your cabin with Mountain Escapes Property Management and Cabin Rentals. With so many cabins to choose from, we have everything you could ever want. Once you've booked your cabin for that perfect get-a-away it's time for some down home mountain fun. There are many adventures waiting for you and your family. Here's what everyone's doing this time of year: River rafting, river rafting, river rafting! The Ocoee River is on of the most popular attractions around these parts and there's good reason why. When the river isn't too high you can grab the entire family to swim down waterfalls and in underwater caves. There's even smaller waterfalls in the shallow end for the little ones to enjoy! For the thrill seeker, The Ocoee Whitewater Center offers some real fun. Have you ever tired river rafting? People visit the Ocoee Whitewater Center form miles around just so they can experience a day river rafting. Did you know that most of our cabins are 30 miles or less from the Ocoee Whitewater Center? Many of our cabins are closer at 15 minutes or less for a day of fun filled adventure on the water. Take a trip on the wild side...it all begins here in the North Georgia Mountains! Mountain Escapes Cabin Rentals is excited to present one of it’s newest additions to it’s vacation rental program. 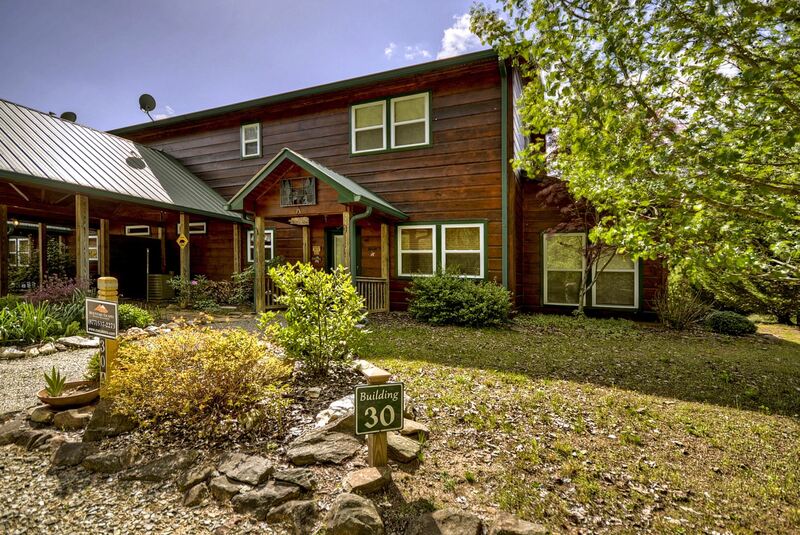 This cabin condo has a great location with trout fishing onsite, very nicely furnished AND affordably priced. The Bear’s Den is located in Suches, GA which is the perfect location for outdoor adventure. You are very close to a number of unique venues like Lake Winfield Scott, a fish hatchery, swinging bridge, as well as trails and waterfalls. Blue Ridge, Blairsville and Dahlonega are all about 25 minutes away. Out the back door you are a just short walk to 1000 feet of frontage of the banks of the Toccoa river. The Toccoa river is well known for its’ fly fishing and Rainbow and Brown Trout. The complex offers community firepits and grills by the river. (Firewood not included, bring your own or you can order a load to be delivered). Bear’s Den is a motorcycle friendly condo with all the atmosphere of a 2 story log cabin within walking distance of the Toccoa river. The owners share their impeccable taste with the furnishings and decor. The main floor hosts the master bedroom with a King sized bed and private bath. The second floor has a large bedroom with a queen sized bed and full bath. Just off the second floor bedroom there is a spacious loft with a sitting area and TV. Along with wifi, Bear’s Den offers a fully stocked kitchen for all of your cooking and baking needs. This cabin also has a roomy dining area with seating for six and a washer and dryer for longer stays. There is also a Sun Room with a Futon for additional sleeping. Mountain Escapes provides guests soaps, toilet paper, paper towels, dishwasher detergent and trash bags. 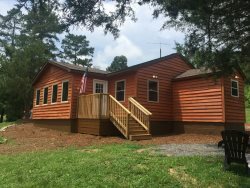 You will need to bring your own charcoal to grill by the river but the cabin has a gas grill on the large screened porch. Firewood is NOT included for the fireplace or the campfire pits by the river. You can bring your own or we can deliver a small load (30-40 pieces for $35) but we must have at least 48 hours notice for scheduling purposes. Food and clothes are all you really need. Come enjoy our little slice of heaven!